Go with the Frigidaire FFAD7033R1. After 40 hours of research and weeks of real-world testing in century-old stone basements, we think the Frigidaire FFAD7033R1 is the best dehumidifier for most people. It's effective at drying air, it maintains an optimal level of humidity, and it's easier to operate than any other model we tested. 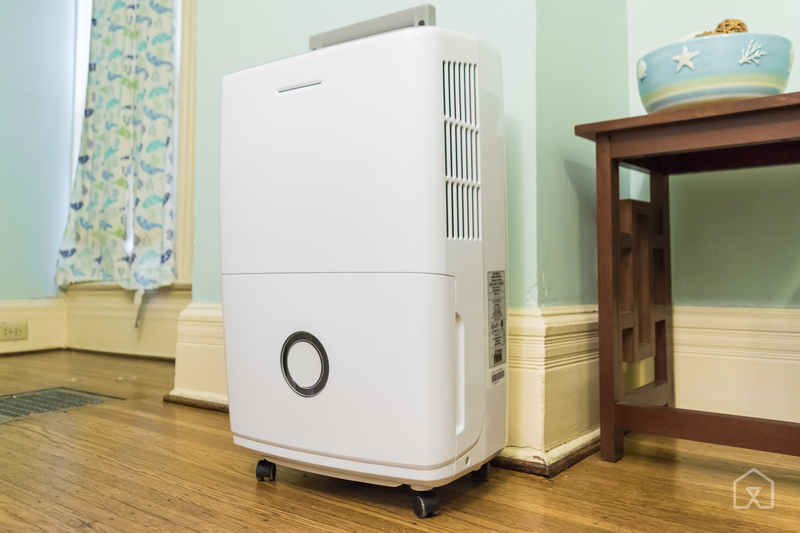 Dehumidifiers are not a cure for a humid living space or damp basement; they are a convenient, affordable way to lessen the symptoms until you can take on the big, often expensive fix of the underlying issues. Constant moisture is a problem in homes for many reasons: It encourages mold growth, damages wood parts, promotes insect infestation, and potentially causes difficulties for residents with allergies or moisture sensitivities. You can do many things to lessen moisture getting into your home, as detailed at Green Building Advisor. 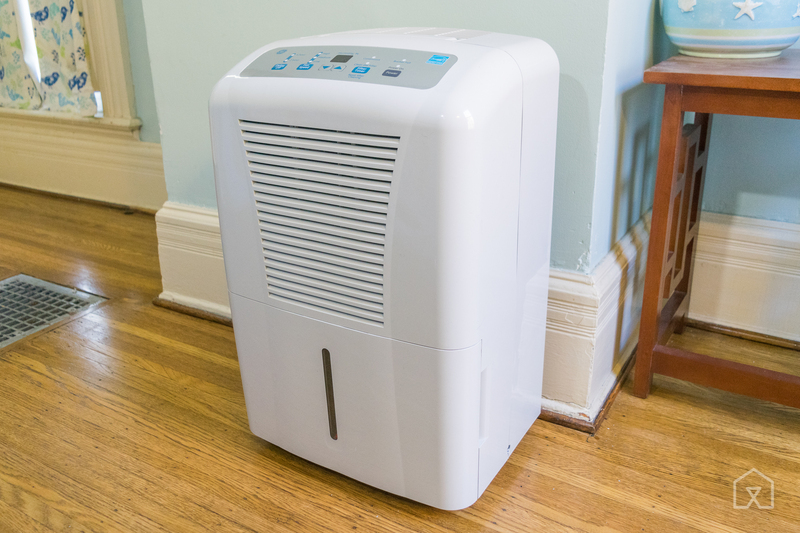 A dehumidifier's capability has a limit: This kind of machine isn't useful if you experience regular basement flooding or need to dry out saturated walls and floors after a weather event. That job requires large blower-type fans, and potentially a commercial-grade portable dehumidifier. We focused on one type of home dehumidifier for this guide, the kind you'll find in most retail stores: condensing. We avoided desiccant-based models, which draw air through a drum of the same stuff you find in packets in new shoes. Desiccant dehumidifiers work more slowly than condenser models, remove far less moisture per day, and are best used for spaces below 40 degrees Fahrenheit and 45 percent relative humidity, a combination that's rare in any home. We also ignored thermoelectric dehumidifiers, which remove only 25 ounces from the air per day under ideal conditions—not nearly enough to dehumidify a room. Condenser units work much like air conditioners, using a compressor and coolant to chill metal fins, and a fan to draw humid air over those fins. The water that condenses on the fins either falls away through a hose or drops into a reservoir that you must manually empty. The appliances work inside the temperature and humidity ranges most homes need, being most efficient around 68 degrees and humidities near 65 percent. We wanted to find a model that could maintain a humidity level around 50 percent; we say more on how we arrived at that target in How to use and maintain a dehumidifier in our full guide. 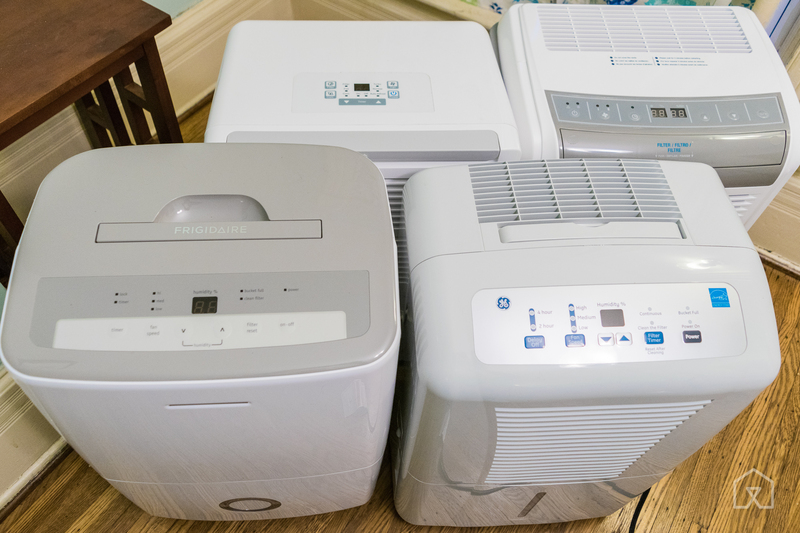 We looked for dehumidifiers with a 50-pint or 70-pint capacity but leaned toward 70-pint models. "Capacity," for a dehumidifier, describes how much moisture it can pull out of the air each day under optimal conditions. A 50-pint model is built to handle a 1,000-square-foot area, and a 70-pint version is designed to handle 1,400 square feet, but we generally recommend the larger model for most spaces, as they run more efficiently in most situations. 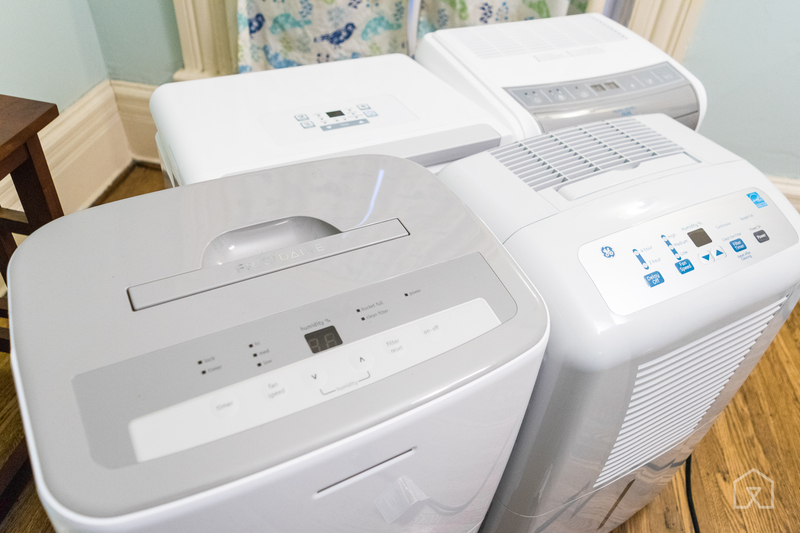 Browse condenser dehumidifiers, and you'll find they look remarkably similar, and seem not to compete on how well they do the core job of removing moisture from the air. That's because almost all of the dehumidifiers you can buy in the US are made by one of two manufacturers—Midea or Haier—and the internal mechanics are much the same. What differentiates the lines and models are their features, how loud they run, and how easy they are to maintain. To differentiate these closely related devices, we combined their Consumer Reports ratings with customer reviews on Amazon and other store sites to create a short list of testing models. We ran each of them for at least a week, recorded their dehumidification performance, and measured their noise levels with a portable decibel meter in both their "passive" (fan running) and "active" (fan running and condenser powered up) modes. After that, we considered distinguishing features: the ease of emptying the reservoir or keeping a gravity-draining hose running, the controls and interface, the reservoir size, the energy use, the presence of easily understood alerts for a full reservoir or a dirty filter, the appearance, and the warranty. We ensured any dehumidifier we recommend offered a "continuous drain" option. This is simply a connection for a garden hose, which bypasses the reservoir and carries collected water out to an existing floor drain or utility sink. It's a completely passive, gravity-based system, and thus virtually fail-safe. The Frigidaire FFAD7033R1 is the best all-around package we found in a home dehumidifier. It brought a basement measuring 850 square feet (plus some crawlspace) from 70 percent humidity down to 45 percent humidity after one overnight session on its medium fan setting; on its low setting, it steadily held the air between 50 and 55 percent humidity. Experts consider this range to be ideal for indoor humidity, but all our picks share that ability. The thing that set the Frigidaire apart was its interface, which was the easiest to understand and use among those of all the dehumidifiers we tried. It was the quietest machine we tested, too, with the most manageable reservoir, and it was easy to move around with its handle and wheels—welcome graces no other model in the test group offered. It's also easier to find in stock, with more reliable customer support, than models from some of the lesser-known brands. The GE ADEL70LR is a close runner-up to the Frigidaire, with a few shortcomings on some details. The good news is that this model is just as effective at dehumidification. The bad news: It's a little louder than the Frigidaire at its lowest fan speed (52 to 54 decibels), and slightly quieter on high fan speeds but with more coil noise and vibration. The reservoir bucket has a handle, but removing it and then aligning it during reinstallation requires a bit more work. You'll find no cord holders, and it's less apparent from a glance that the bucket is full (although you'll probably notice that because the machine won't be running). If you can't continuously drain your dehumidifier to a lower-level drain with a hose, we recommend a dehumidifier with a built-in pump. GE's APEL70LT is our pick in this case. Internally, it's identical to its no-pump sibling, the ADEL70LR, our runner-up. The APEL70LT is a bit louder than the ADEL70LR itself while the pump is operating, but the mechanism comes on only intermittently (as the reservoir fills), and pumping is far more convenient than emptying the reservoir manually. Dehumidifier makers don't specify exactly how far such units can pump water, but reviewers report no problems getting water up to sinks or out basement windows, where a gutter or drain field can carry it away from the house.